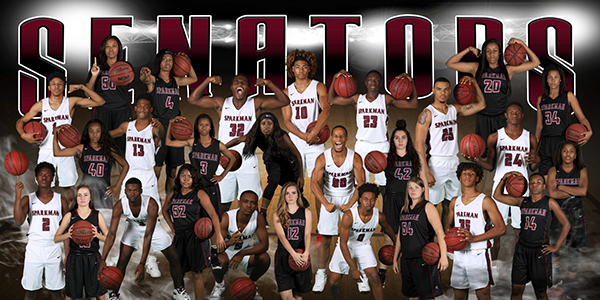 The basketball teams show that they are ready for the upcoming season in their promotional photo. The long wait for the start of basketball season is finally over. The teams are pumped up and ready to endure there season. The fans are excited as well as the players; join them all Friday night so that the team will have a great crowd to start their season alongside. The teams have improved and grown closer together and they are ready to go. Lots of preparation has went into this season. The teams have been practicing together for several weeks after school, but they have practiced continuously throughout the summer to better prepare themselves for the season. Practicing as a team isn’t the only way they practice. Each player practices individually on their own to improve different skills that they need personally. Basketball season can be a long and tiring season, so the players have to make sure they are in excellent condition, so they can endure the season. Injury can be serious punch to a team. So the players must be prepared and ready. With the season coming up quick, the players have high hopes. A strong support from the fans help to drive the players to win. Having a student section is a great way to support the team. The basketball team deserves a student section as much as football or any other sport. When fans are supporting the team, it motivates them to win. The players are sure to give you a show if you come out and attend. Each and every season, teams lose their valuable players, seniors. It is then time for other players to step up and grab the reigns as leaders on the team. Losing seniors can make a huge impact on any team. This year the basketball teams believe that they are going to be able to play together and have a great season even with the loss of their seniors. There is lots of leadership still on the team, and more leadership developing each and every day. Basketball season is always anticipated and this year is no different. Everyone is excited for the start of the season and the many accomplishments the team will achieve this year. “It’s going to be a good season,” Tyson said “We just gotta play together and our season will be great.” With this being said, you know the players are excited and ready to go, therefore the fans have to be excited and ready to go with them. Support alongside the team leads to an excellent season.